At day two here at the DAM-X event, race director Tom Hartmann called the riders for an early meeting. With a fairly strong forecast for southerly wind in the morning hours, the first possible start was schedulded for 08.30 am. However, it took a couple of hours until the conditions looked suitable to kick off with the first junior heats. Local boys Tigo Kort (Severne) and Tijmen Meijer (Severne) could land some tricks in the light wind, but certainly couldn’t display their skill-level. 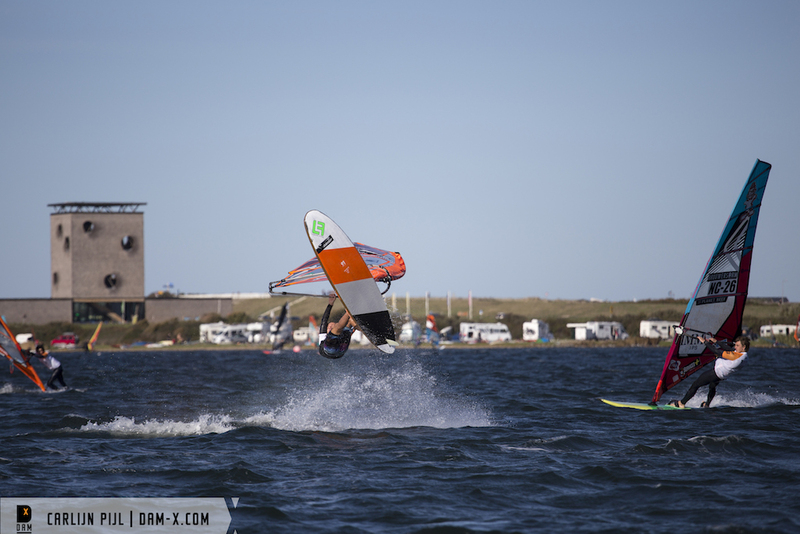 Juniors head-judge Thijs Van der Meer decided to cancel the heat and stay on stand-by. It was just around 2.30 pm when the wind started to increase to a point that would make a a fair race possible. Despite the conditions being on the light side, the 16U juniors proved their potential and showed some great competition sailing. The nine minute heat duration was giving them enough time to go through jumping moves as well as jibe variations. Standing out in the junior boys were local riders Tijmen Meijer (Severne) and Bodhi Kempen (Severne) as well as 11 years old Val Erzen from Slovenia. Lennart Neubauer (Severne), riding for Germany but living in Greece, who is competing on the tour for several years already, impressed as always and performed his way up to the winners final, where he will face the winner of the heat between French sailor Nil Bacon (Severne/Fanatic) and Corto Dumond (Severne). Stefan de Bell (Severne) from Curacao will expect the defeated one of this battle in the losers final. All the top four guys landed regular and switch moves on both tacks. 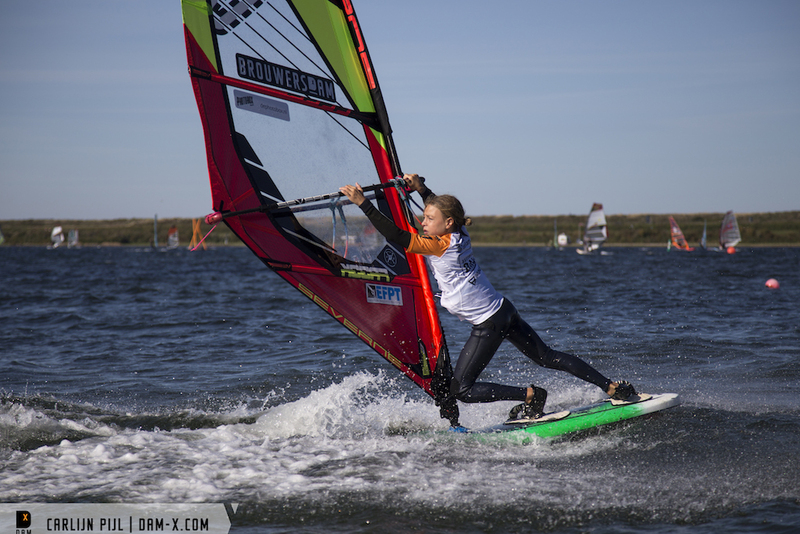 In the junior girls division, Lina Erzen, who won the PWA freestyle junior title this year, lived up to her role as a contender for the EFPT junior title and will meet local rider Sterre Meijer (Severne) in the winners final tomorrow. In the losers final Salomé Fournier will have to battle against Margo Kurvink. 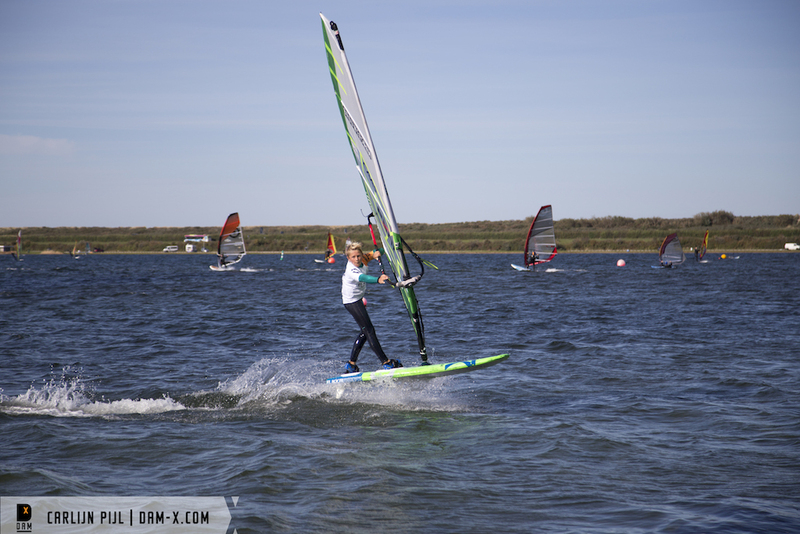 Alongside the juniors, the pro fleet had been sent out to the water as soon as the wind looked strong enough. Mickey Wieczorek (Severne/Severne) from Germany, who is one of the rookies at this competition, already stood out in the freesailing and could take down Pavel Khomenko (Goya/Goya) from Ukraine, to then get stopped by Giovanni Passani who proved to be on form even in the light and challenging conditions. The Italian stayed completely dry throughout his heat and put down the highest score of the day. Filling up his judging sheets has also been Vladimir Yakovlev (JP/Neilpryde) from Russia, who is always a solid competitor at this event and who is definitely favored by the lighter wind. Local rider Nick Van Ingen, impressed with stylish maneuvres to take down Dutchie Sten Bremmers (Severne). With the dropping wind heat 11A/B seeing Mattia Fabrizi (Patrik) against Stefan de Bell and Francesco Cappuzzo (RRD/RRD) against Aron Etmon unfortunately had to be called off. The competition was kept on hold and the late afternoon hours have been used for the annual EFPT meeting, to get feedback and to discuss the upcoming season. With a great forecast for tomorrow, skippers meeting is once again schedulded for 08.00 am when we hope to continue with the final of the junior and the remaining heats of the pro fleets single elimination.